Amy Steffian | Alutiiq Museum Sep 2, 2018. 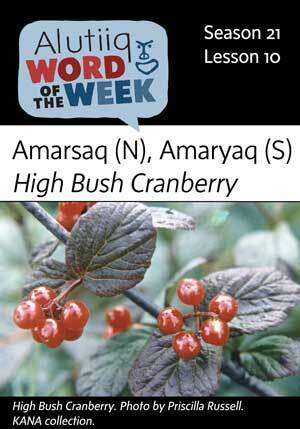 Amaryat quuhnartaartut.—Highbush cranberries are (always) sour. The highbush cranberry (Viburnum edule), known locally as the bog berry or sour berry, is a large flowering shrub that grows in Kodiak’s thickets and clearings, often in shady spots. This plant, found widely across North America, produces small red berries that dangle from a long stem in small bunches. Be careful, it is easy to confuse this plant with the poisonous baneberry. Alutiiq people harvest highbush cranberries for food and medicine, picking them as they ripen in late summer and early fall. They are collected in as large quantities as larger lowbush cranberries, although their small size makes picking more difficult and time consuming. Highbush cranberries are made into jams, jellies, and syrups and added to desserts. 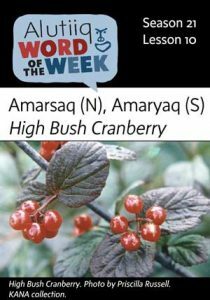 This berry is also a favorite choice for akutaq, a traditional dessert where berries are mixed with fat and flavorings like salmon eggs, mashed potatoes, or in modern times, sugar. These berries may also be stored in oil for later use. Many people mash the berries for their juice, which they use to treat sore throats, colds, and respiratory illnesses. A spoon full of highbush cranberry jelly in a cup of tea is not only tasty but soothing.